Once all the housings are assembled, glue and screw and then you will have a gate that will last for 20 years. If for outside use, make sure you utilise fully waterproof glue; polyurethane, epoxy or urea-formaldehyde are best. FINISHING TOUCHES: Finally, plane up the end grain of the rails, slightly bevel the sharp edges of the uprights and paint with primer, undercoat and top coat. If for inside use, apply varnish. We have already looked at timber, its characteristics, its cost, how to order it and cut it to length, and now I am going to join some lengths in a simple frame. Furniture is either solid or framed. 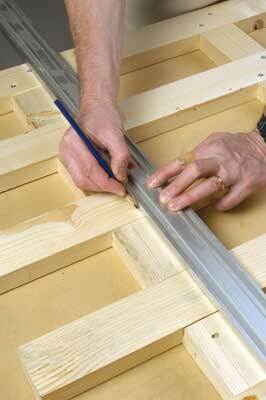 Framing uses less timber, is quicker to make and easier to adapt to the design needed. 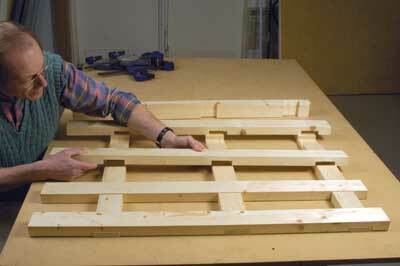 I am going to make a flat, one-dimensional frame - otherwise called a gate! This particular gate is to go in a relative's house at the top of a steep set of stairs, but gates are required in all sorts of situations in a property, not just at the entrance to the garden. You could vary the length and number of uprights to suit. 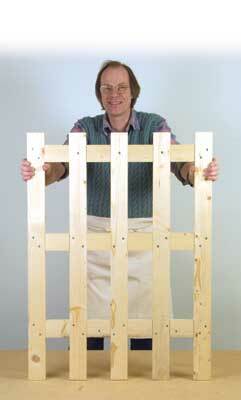 Make two gates and put a third long 'gate' on the top, for example, and you have a potting bench. Make it a bit more sophisticated and you have a dining table. (I once made an 8ft dining table out of scaffold planks and a couple of trestles, but that's another story.) The ability to make frames out of joined timber spawned the entire furniture industry about 4,000 years ago. 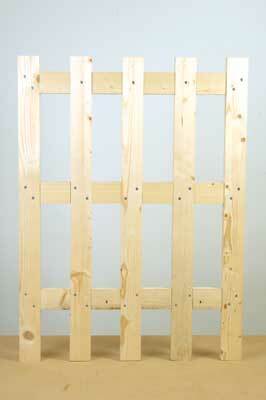 Using the price guide published last month, the 5m of 75 x 38mm PAR timber needed for this gate would cost about Â£15. 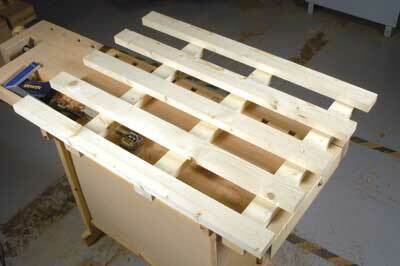 1 Set out the width of the opening on the top rail. 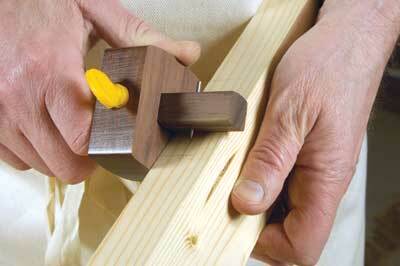 Make sure you allow for the hinging post and the latch post. If, as here, the gate is to go in a staircase between two walls, the posts need to be fitted in the available space as well as the gate. 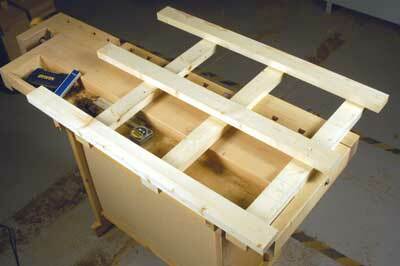 Allow 6mm each side for the clearance that the gate will need to swing shut as well. 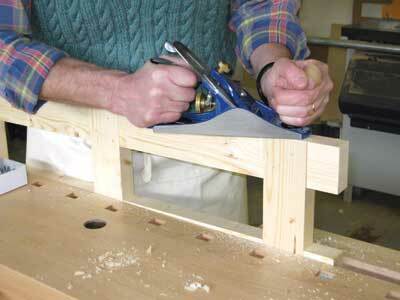 3 ...then divide the remaining space left and right of the central upright with suitably spaced uprights. Mark the outside edges in pencil, remove the upright and mark where it is going with a pencil cross. 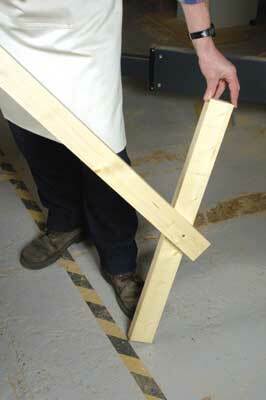 4 Measure the thickness of the timber and mark a line at half thickness where the intersections are to occur. Using a marking gauge is much more accurate than pencil and flexible tape. 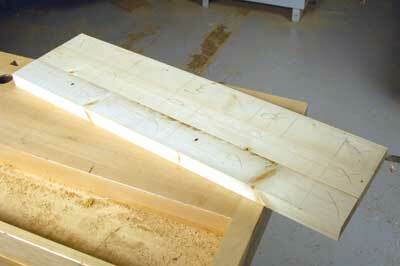 Mark the depth of cut on both edges of the timber. 5 Cut down to the line at each joint, using a tenon saw, a circular saw set to appropriate depth, or the trenching facility of a sliding mitre saw. 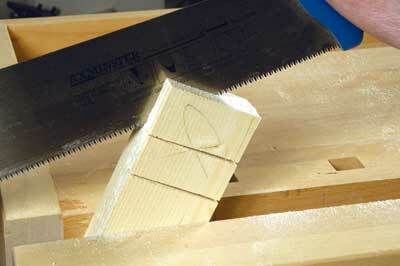 It is hard to be accurate with a hand-held circular saw so cut well inside the waste and trim back later. You will see that I have made 'relieving' cuts to make chopping out the waste easier. 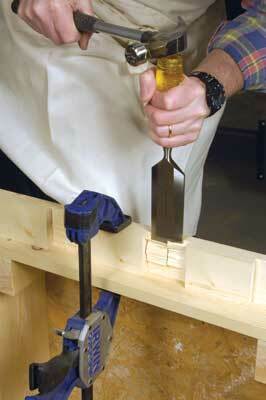 6 Turn the timber on edge and, using a mallet, chop a small portion of the waste away. Don't try to be clever and do the whole thing in one go, but work in thirds. 7 Now clean up down to the bottom of the trench. 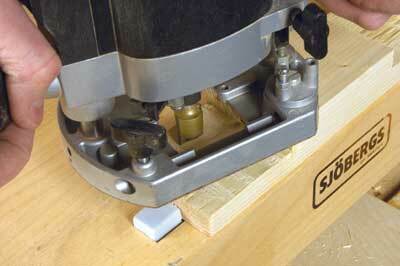 9 ...then clean up the base of the housing with the router, which of course you set on one setting for the entire job. 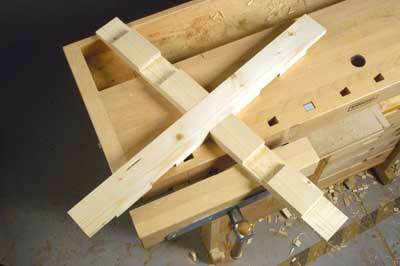 10 Do the same for the pieces that run at right angles and put the interlocking pieces together. Be careful when you take them apart as there is a tendency for end-grain fibres to catch and split out. 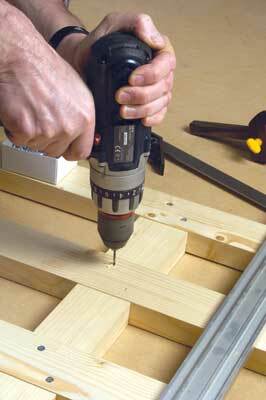 11 To set out the screws use a straightedge and try to make symmetrical patterns. 12 Once all the housings are assembled, glue and screw and then you will have a gate that will last for 20 years. If for outside use, make sure you utilise fully waterproof glue; polyurethane, epoxy or urea-formaldehyde are best. 13 Finally, plane up the end grain of the rails, slightly bevel the sharp edges of the uprights and paint with primer, undercoat and top coat. If for inside use, apply varnish. 14 Fifteen halving joints later and you have a strong and stable stairgate. "The ability to make frames out of joined timber spawned the entire furniture industry about 4,000 years ago"
A-B New chisels are not sharp unless they are very expensive ones from specialist companies. The first thing that you have to do is flatten the back on a coarse diamond stone. 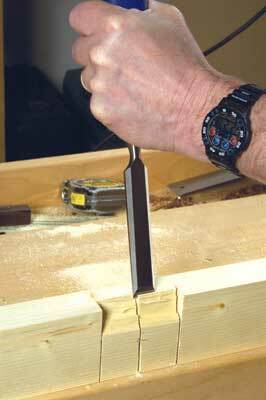 You should end up with the sharp end of the chisel showing a polished face. In this case the polish extends up the sides of the chisel, showing that there is a slight hollow in the middle of the back. This is good. If there had been a bump in the middle of the back I would have sent the chisel back to the manufacturer. Chisels with 'bellies' on the underside cannot be sharpened correctly without engineering experience. C Once the back is flat and polished, the bevel can be sharpened. The bevel will have been ground by the manufacturer. All you need to do is use a honing guide and a fine diamond stone to produce a polish on the front of the bevel at a slightly steeper angle than the ground bevel. 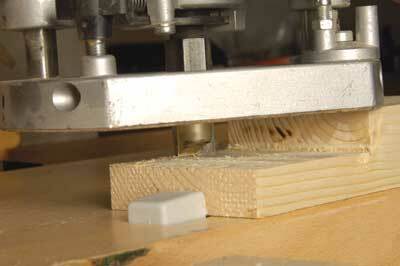 Once the bevel is polished you should be able to cut a clean shaving from the end grain of soft pine. Use the proprietary lapping fluid sold by the stone manufacturers as a lubricant on the stones. Of course they are not really 'stones' but diamond plates and should always be kept clean and dry when not in use as they are quite expensive and will last for many years if used properly. If you use old-fashioned stones then make sure they are perfectly flat before using them.